If there is a single most popular image of Big Sur, it is probably of the 80 foot falls seen from this trail as McWay Creek cascades onto the sandy shore. The falls, creek and canyon are named after Christopher McWay, an early settler and farmer from New York state who arrived in the area with his son Christopher Jr. around 1874. The park itself is named after Julia Pfeiffer Burns (1868-1928), a local and legendary early pioneer and resident who impressed Helen Brown and had run a ranch in McWay canyon with her husband, John B. Burns. This image belongs to the travel and nature stock photo library. This stock photo of McWay Falls in Black and White is available for licensing for commercial and editorial uses including websites, blogs, books, magazines, brochures and advertising. Restrictions may apply for images which contain third party copyrighted material or sensitive subjects. Photos of artwork are for editorial use only. 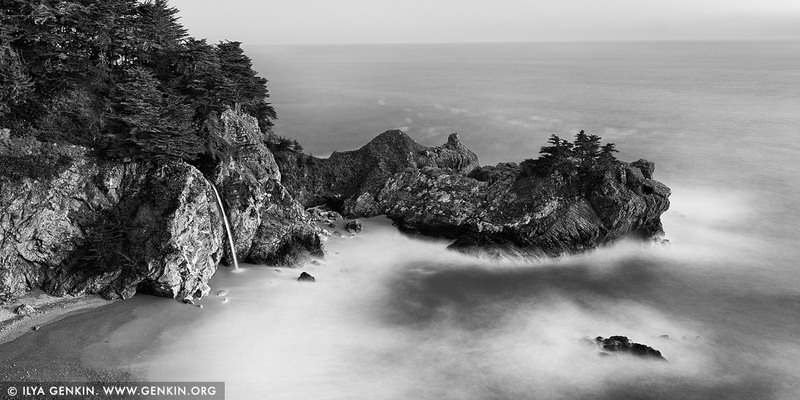 This image id BIG-SUR-CALIFORNIA-USA-0002 of McWay Falls in Black and White, is copyrighted © by Ilya Genkin. This is not a public domain image.